Oh, the joys of those who are kind to the poor! The LORD rescues them when they are in trouble,~Psalm 41:1. “The King will reply, ‘Truly I tell you, whatever you did for one of the least of these brothers and sisters of mine, you did for me,“~Matthew 25:31-40. This past weekend Operation God is Love commenced. It’s been ongoing in prayer and other aspects, yet going out into the community started this past weekend. God sees the people we don’t see. 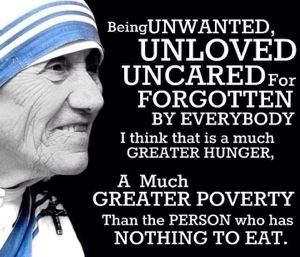 God cares about the people we don’t care about. Every person on the planet matters to God. Our journey started at 9 am with breakfast, fellowship, worship, and prayer. Then we ladies headed into the city. We parked, grabbed our supplies, and started walking. We walked and prayed. We prayed for a release of God’s Kingdom in the area. We prayed blessing over businesses and protection over the people who live there. God has given us authority in His name to push back the darkness. We stumbled across a young homeless man. We shall call him Martin (not his real name). We offered him a goodie bag (cereal bars, snacks, bible, info, etc) and prayer. It didn’t seem to be enough. There was a sadness in his eyes I still can’t shake. 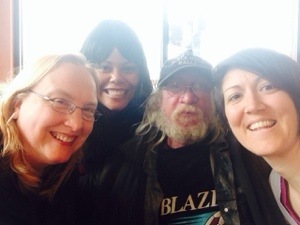 We invited him to lunch…as we sat with him in this city pizza place…his story is one I won’t forget. He’s partially disabled, has no family help, and has lots of pain. He showed us the pins and injuries in his legs, and spoke with tear filled eyes. “Churches give you food and handouts, but rarely a place to stay or help finding employment. Shelters give preferential treatment to women and children. They give you food, but no bus passes to get to a job. Other people assume you’re an addict so they won’t help you. People walk past you on the street and look at you like you enjoy begging. I am so ashamed. I want to work. I want to take care of myself“~Martin. We watched Martin wipe away tears. Though we prayed for healing, favor, freedom, provision…he needs a miracle. He said he couldn’t understand why we’d stop and listen to his story or invite him to eat. He wondered what church sent us out..we told him we came on our own. No pastor sent us out. We told him Jesus sent us to love people, plain and simple. Martin matters to God. He held his head low every time we told him how much he meant to God. We met many homeless people. We met a woman and several men. All with tear filled eyes, profound stories, and a desire to be seen, fed, & loved. I don’t know fully how they all ended up there; is it or was it their fault they are on the street. It doesn’t matter. Jesus tells us to love people. The greatest solution and Redeemer I know is Jesus. He didn’t tell me to only love those who love me or the shiny, happy, wealthy people. He said love everyone as I have loved you. I don’t advocate just handing out money to people, unless God leads you to. I don’t advocate going out alone into cities to help people. We go out in the day, in a group, and stay on well lit and public streets. We don’t go into houses or dark places. We don’t carry loads of cash. We don’t give out personal information or offer to do things for people beyond the scope of the mission or Holy Spirit leading. Lastly there was Paul (not his real name). The morning after worship, one of the ladies said let’s wait and see if God gives us clues about people we need to share the Gospel with today. I kept getting blue sweatshirt, but dismissed it. While we were talking to Martin, Paul rides up on a bike in a blue sweatshirt. Thought nothing of it. Once we left lunch with Martin and his friend, we went looking for Paul. We found him on a ledge watching cars go by. Paul was suicidical. He had told God that day he had planned on running out into traffic because he had no hope. We told Paul, “God sees you! God loves you. There’s hope in Jesus.” We were able to share the Gospel with Paul, to bring hope and encouragement, and pray suicide off him. We told him the blue sweatshirt story and how God sent us there for him. He too cried. It’s moving to see a grown man cry. We gave him goodie bags for himself and others. Paul, Martin, Sam, Lorrie… The people we met, none of them asked us for money. They were happy to hear the Gospel, for prayer, to be given a hug, for a meal, for someone to listen, for someone to care about them. Love wins! I can’t do everything. You can’t either. We can do something! I’m excited to hopefully share more testimonies with you throughout the summer. I am praying God invades our city, nation, the world with born again believers willing to love the least, the last, and the lost. See picture below of us with Sam (not his real name). Quite the character. He prayed for us! How sweet is that. He kept saying how blessed he was and how good God had been to Him. Ah, to have perspective… God bless friends. You are deeply loved (John 3:16). God is Undefeated! You can be too!! Reblogged this on Just Thinking Aloud. This is amazing Erin. I can imagine if Jesus was in the world today He’d be doing exactly what you are doing: reaching out, loving, and caring for those who are poor and in need. Thank you for being a wonderful example to us all of what it means to put God’s Word into action. May you continue to always serve Him faithfully in everything He calls you to do. Be blessed! !